Several Ubisoft free-to-play online games, including The Mighty Quest For Epic Loot, are getting shut down. In this era of always-online gaming, one of the inevitable truths is that all severs will eventually come to a close. Such is the case for three Ubisoft free-to-play online games, where had their servers shuttered over the last week. The games in question are Tom Clancy's Endwar, Might and Magic Duels of The Champions and The Mighty Quest For Epic Loot. Click on the names to view the respective blog posts regarding their closures. The short and skinny of it is: Endwar and Might and Magic will remain playable until October 31, while The Mighty Quest For Epic Loot will shut its doors a little earlier on October 25. None of these games will get any further updates between now and when they are shut down. It's a bit of a shame, especially when you consider some of these games were recently released. 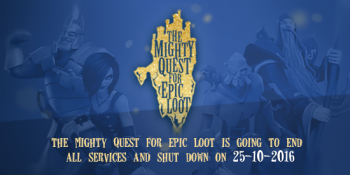 The Mighty Quest For Epic Loot, for example, is only a little over one year old, being released in February, 2015. At the end of the day, everything that requires an online server will eventually come to an end. Even the mighty World of Warcraft will one day close its doors for good.